Let's talk about some of the weird things I've taken pictures of to send to my husband lately to give you a glimpse into my everyday living in Korea. YEAH BOYYYY, those are public trash cans! While I am CONSTANTLY extolling the virtues of Seoul having clean public restrooms in almost every subway station, all over parks and just on the street in many neighborhoods, I rarely mention that the trade off seems to be filthy streets and no public trash cans. This is both frustrating to me as somebody who likes to drink bubble tea on the go and has a Californian's deeply ingrained aversion to littering so ends up carrying a cup of melting ice for miles and as a dog owner who just wants to be able to throw bags of poop away as soon as possible. Thankfully, there are (some) trash cans in the park but there aren't any for the majority of the walk between our house to the vet or between our house and the dog cafe. So more public trash cans is basically the most exciting thing to happen in the last month. 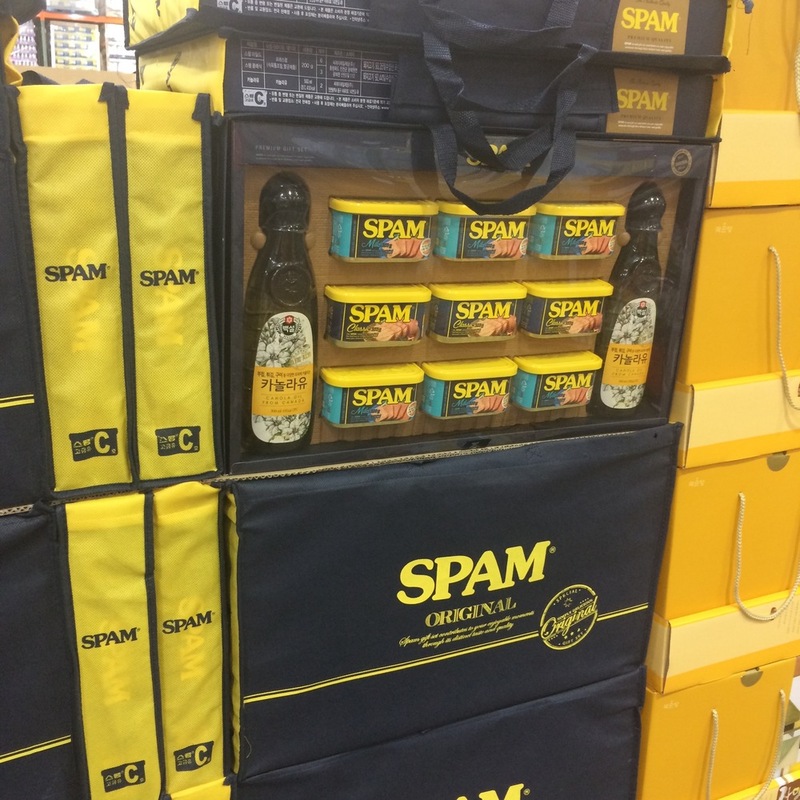 It's almost Chuseok (Korea's harvest festival/Thanksgiving) which means on my last trip to Costco the SPAM (and knock off SPAM) gift sets were out in FULL FORCE. Because of food shortages after the Korean War, products like SPAM and other canned foods brought over by the American Military were highly prized. Korea is still the second largest consumer of SPAM in the entire world and these gift sets tend to show up around major holidays. As an American, I can't think of anything less luxurious than SPAM but in Korea, it's a big deal. What even is the Sea of Japan? It's always the East Sea, and don't you forget it! As far as I can tell Tasty Road is travel/food show hosted by one former and one current K-Pop singer who make questionable culinary endorsements. One of these signs outside an establishment basically guarantees droves of Koreans showing up, standing in line and making heavy use of the selfie stick to make sure they get themselves and the name of the establishment in the picture and thus, another fast cycling food trend is born. I have mixed feelings about them endorsing the Hot Dog on a Stick that opened a few months ago because I don't want it to go out of business because corn dogs are delicious and it's open at 2 am making it the perfect place to stop for second dinner on our way home from a night out in Itaewon BUT I don't want to ever have to stand in line for more then ten minutes to get mall food court food. 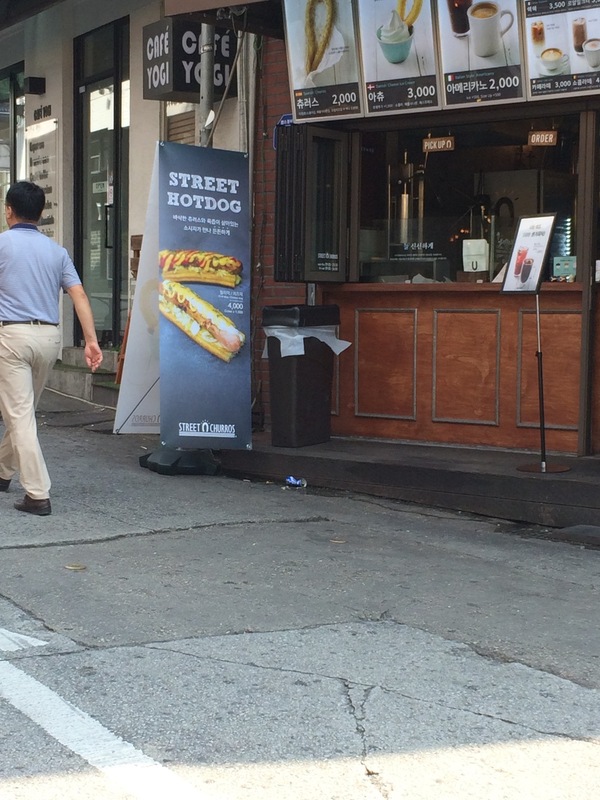 Also, the same day I saw this sign outside, I noticed that Street Churros now has a Street Hotdog. Yes, that is a hotdog served on a churro, combining the food trends of yesterday and today! Coincidence? I think not. In the Spring, a hastily, poorly constructed deck suddenly appeared in front of a business which always had its gate down. A few days later, the gate was up when I walked by and I noticed taco related words on the wall in passing. A few days after that I saw what appeared to be a counter with a steam table behind it and some tall tables set up. "Yes!" I thought, "it probably won't be very good tacos but it will be near me!". Except... fast forward to two weeks ago and it still hadn't opened and suddenly the hastily constructed deck and ENTIRE front of the building were removed. Now there's a tarp covering it. The good news is, I realized how inappropriate the taco related words were when I saw them this time and managed to snap a picture. RIP obscene taco place, I'd pour out a bottle of Tapatio for you but that stuff is more precious than gold here.